The quest to find safe and effective way to add bright colours to wooden toys. Legend has it that there was a time when wooden toys were painted with lead based paint. When I was a child, some few years ago, I remember lead toothpaste tubes. That was a time before we realised how toxic lead really was. Finding a Non Toxic Paint That is Child Safe and Zero Volatile Organic Compounds in an Over-Toxicated World. An article on non toxic paint by Deliah Jones, who is an expecting mother with a passion for zero VOC paint and its impact to consumer safety. She is also interested in how a 100 percent non toxic paint [http://www.mythicpaint.com/] and low odor paint can correlate for baby and pregnant women. Learn the difference between zero Volatile Organic Compounds and non-toxic paints. Which paints are safe for you children? If you make wooden toys for kids, there is no doubt that you would be aware of the need for child safe paints. Putting colour on to wooden toys for children does not always mean using paint. 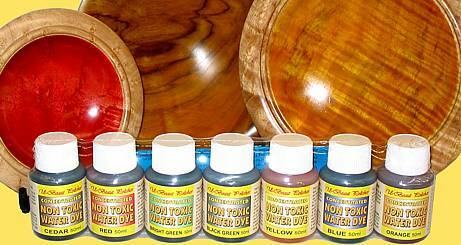 There is an alternatve in the form of non toxic water dyes.